Post Your Latest Bushcraft Purchase! Discussion in 'General Bushcraft Discussion' started by Bill Cox, Apr 11, 2013. 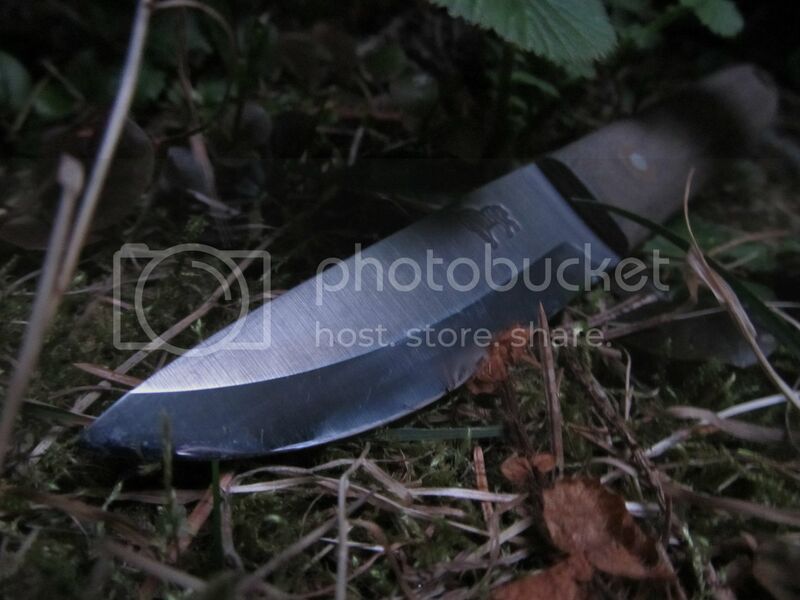 Whats your latest bushcrafty purchase, a knife, a pack, an atv or a new spork? It doesnt matter what it is let out your inner gear addict and post a picture and let us know what you got! EDIT - I wasn't sure exactly where to put this so if mods think of a better spot please move it. Ontario Afgan Ranger Bush I picked up a few days ago. Samurainova, Sosteve, woodsmanjohn and 6 others like this. This knife does it all! I've prepped several meals with it, including thin slicing garlic and ginger. I've butchered several chickens with it. I've boned out chicken legs and thighs with it. 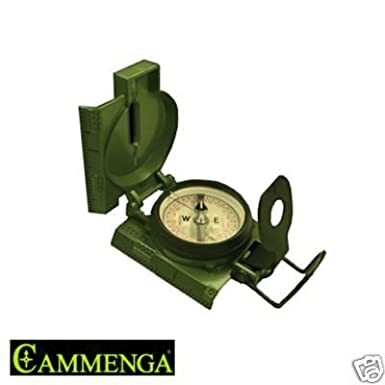 Sosteve, woodsmanjohn, BushcrafterAU and 5 others like this. Yikes! ANOTHER knife I must get. Sosteve, woodsmanjohn and The Bushcraft'n Teen like this. Survin and Thrivin in Southern Indiana. Coleman's stainless cookin kit and a cup that nests on the bottom of it. Got em both @ Wally World for bout 20 bucks. It seems to be pretty good quality (as good as you can get from Walmart =] ) for the money. Sosteve, Yellowbear79 and woodsmanjohn like this. insector, Sosteve, Jeffa and 3 others like this. i got one of those gsi-like stainless steel cups with the folding handle from walmart. $4.88. insector, Sosteve and woodsmanjohn like this. insector, Sosteve and edgybob like this. Where did you get the sheath's for the fiskars? those look great, I have both of them. Sosteve and ManyHammers like this. Really like but wish it had a blade length around 4.75''. Sosteve, D. Thorpe, woodsmanjohn and 2 others like this. Me too! Where'd these come from? Pleeeeaase? Sosteve and woodsmanjohn like this. Tilley outback hat for me. Gonna break it in during opening day of trout season Saturday, oh and a new nalgene. Wait a minute, I'm confused; It's a can of bacon strips (albeit inedible ones)... what more of a prize inside could there be? I know... no pics, but I'm workin on it. Becker BK16, stripped, with hot apple cider vinegar patina. Lately all I wear is Tru-Spec 24/7's but I decided to experiment with a new pair of lightweight "Genuine Gear" pants. So far not bad. Wife picked me up 2, 1944 Knapp Monarch US mess kits at a silent auction. $15.00 total in excellent condition. She done good. Correction, one of the kits is a M.A. Co. kit from 1944. They are nearly identical but not exactly. Sosteve and BushcrafterAU like this. I bought gasoline, to go to the woods, and some food to eat while in the woods. SpookyPistolero, Timex, TomJ and 12 others like this. Why must you encourage my terrible gear spending habit!!! Sosteve, woodsmanjohn and geojag like this. Old Hickory meat cleaver for batoning wood. See photo below. Does a durn fine job without me beating the crap outta my knives. Just google kiahdex. Really great to do business with. Sosteve and Holmesmade like this. Last week I receivean Aurora fire starter and a rothco european style wool blanket. I got tired of waiting for the smell to leave, so I sprayed it with febreeze air spray yesterday afternoon and put it in the washing machine last night. I haven't ran it through the dryer, but I'll wash it one more time without any soap and then tumble dry. Not directly bushcraft related, but I had to order a new phone because mine is 3 years old and starting to go out. The new one will have a better camera and video recording. Sosteve and BryanGA like this. 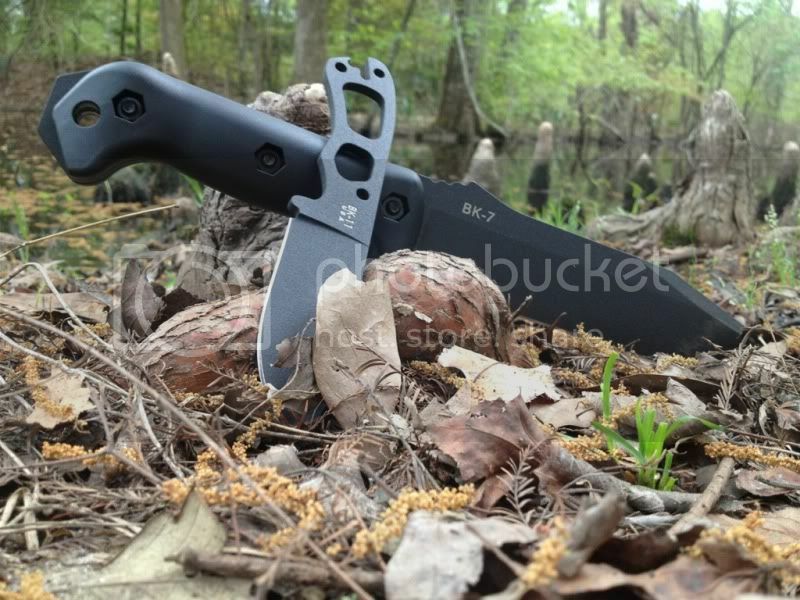 Becker BK-11 w/ custom Azwelke kydex. Well I spent alot of time reading from my BK-2 thread. I ordered the BK-7 and also while reading I found the BK-11 and ordered that also. Ill post pictures when they get here. insector, Retropwn, Lee C. and 7 others like this. Just received a Special Grade Old Hickory 14" butcher's machete from Baryonyx. Haven't had a chance to really whoop on it much, yet. Gonna be fun, though! May have to buy some more leather to make a sheath for this beast. I'd have to crazy quilt one together out of what I have left. insector, Sosteve and BushcrafterAU like this. Sorry to act like a 50 year old child, but I am excited, the toys have arrived. Lee C., The Private, Sosteve and 3 others like this. 2 half cow hides to make gear out of and a few misc leather working tools. insector, Sosteve, woodsmanjohn and 1 other person like this. I was in need of a drawknife, so I purposely focused my search for a folding one that would be easy to pack. Found a decent vintage one on fleabay for a small price. Too beat-up to be a collectible, but with a good blade - so I won't be afraid to use it. A Stanley camp cook set. 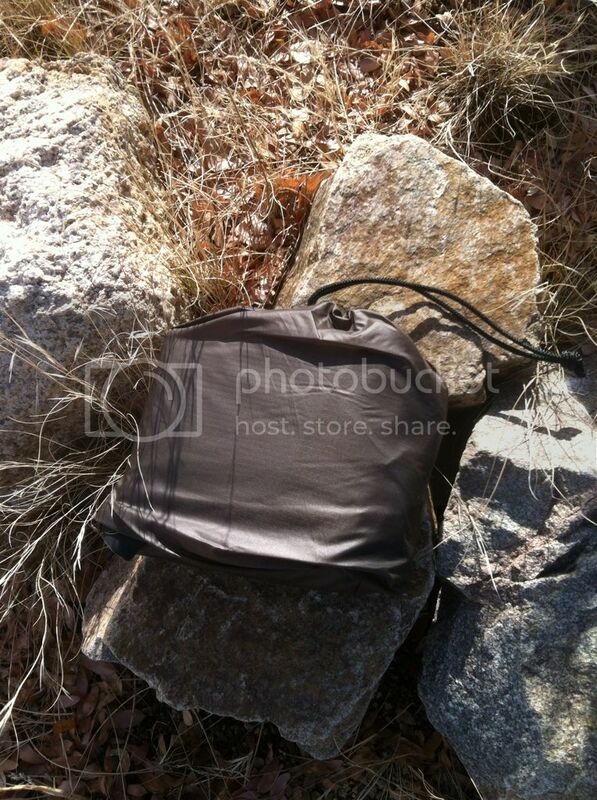 10x10 $7 poly tarp. 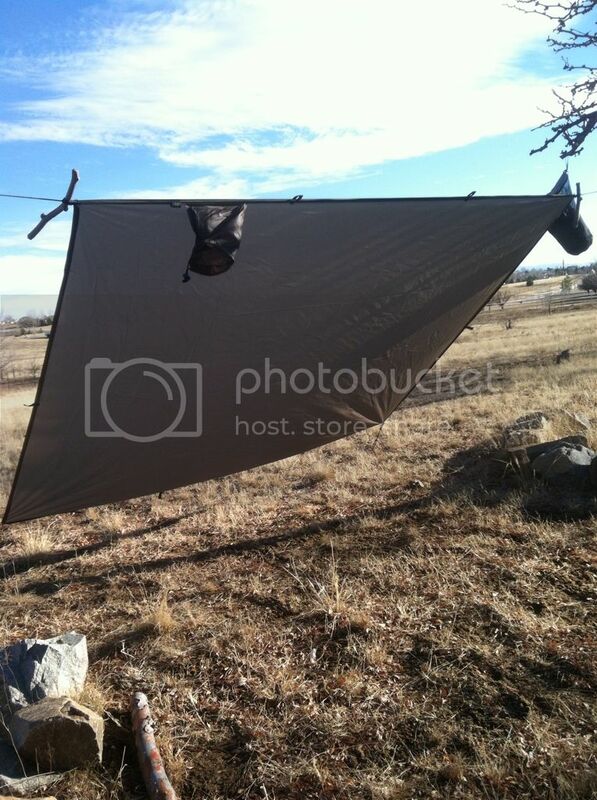 A little difficult to fold up solo... but worked great to keep the dew off me. insector and Sosteve like this. Latest Bushcraft purchases: Snow Peak Personal Cooker 3 (SS), Emberlit Stove (SS), Mora 612. 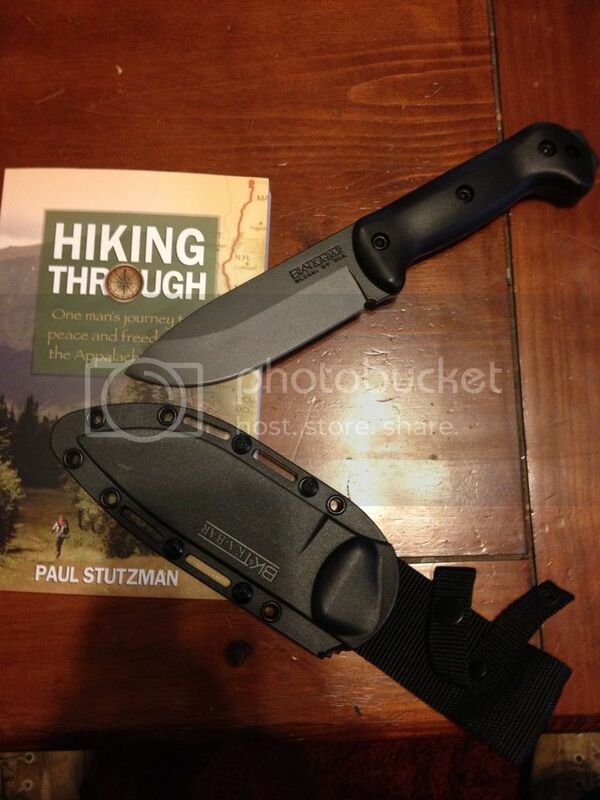 Becker BK-2 and a book on the Appalachian trail. Sosteve, westernb and Denman like this. BHK Boat Tail Scandi. I've had it for about a month and I absolutely love the thing. insector, Sosteve and Gorchiza like this. 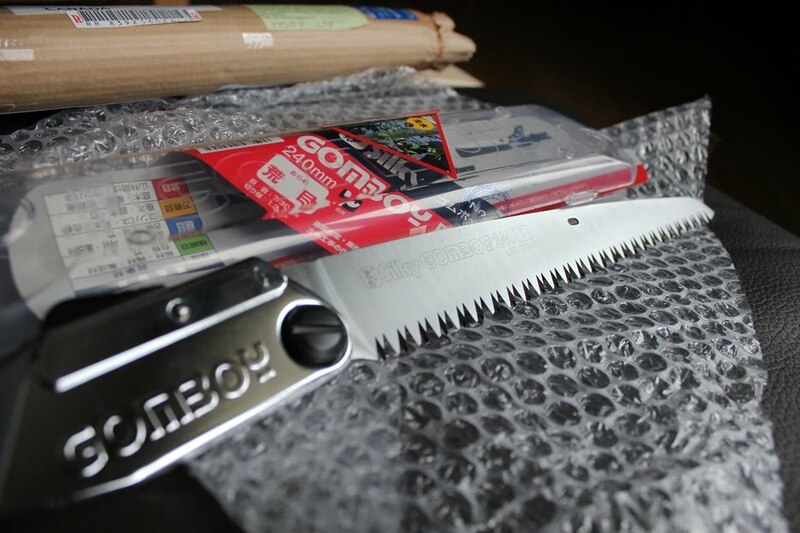 Received from C. Ellison in Japan, a Silky Gomboy 240 saw. Wendy Owens, The Private, Sosteve and 3 others like this. Silky Big Boy - Large Teeth. About the same size as my 21" Sven saw so I was willing to try the larger size saw. Trying it out to see if it binds as much. insector, The Private and Sosteve like this. Thanks Bill, good timing for this thread; I just got these in the mail about 3 hrs. ago. Curse you Bill for making me take photos of shiny metal surfaces (blame Bill for crappy photo - best I could do). Ahti Leuku 180mm from www.Lamnia.fi, Silky Bigboy from Chris in Japan www.CEllison.net (it finally came, Chris!). Damn is that Ahti sharp (other than my Rapala's, my first Scandi Grind - I cut my skin 4 times just oiling the knife and putting some finishing wax on it)! Sosteve, BushcrafterAU, Early Man and 1 other person like this. RSV I opted for the Large teeth instead of the extra large teeth in the hopes it would cut dry wood a little better. larger teeth = green wood, smaller teeth = dead wood. was hoping to get a happy medium between the two. 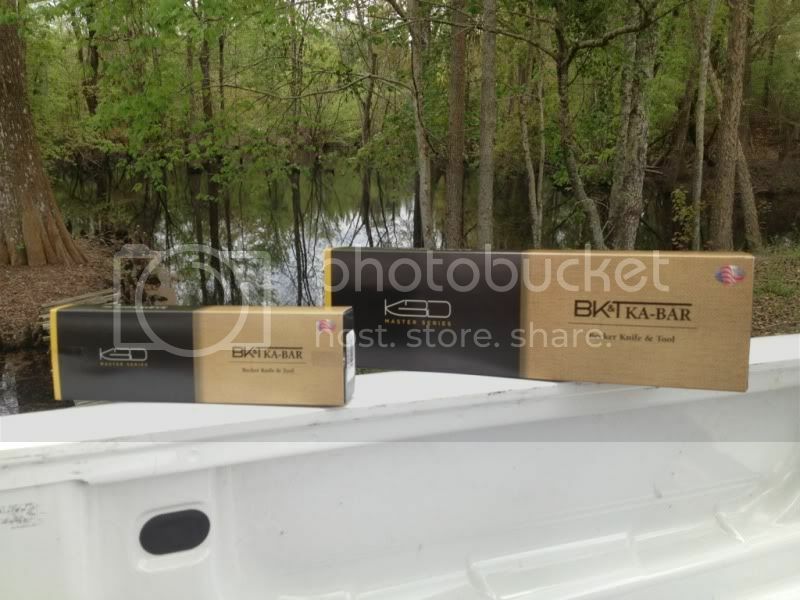 Box of 20 ga slugs (the advantage of owning more than one caliber/gauge of gun, I can buy what's there instead of bemoaning that my caliber is gone. Wish I would have got a .30-06 instead of the .308 I got last thanksgiving right before sandy hook >.<) an aquamira frontier filter straw for the possibles bag, rite in the rain notepad (passed on the space pen that goes on the keychain... For 20 dollars! ill just use a wooden pencil for nao) 50 ft of 550 cord and the G-flex marine epoxy I need to patch the hole in my canoe. 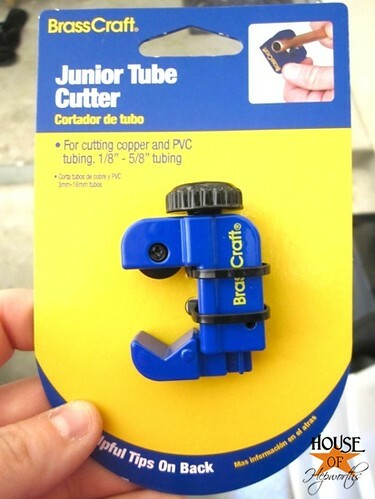 $10 pipe cutter for cutting aluminum arrow shafts into sleeves for footing carbon arrow shafts. Works awesome. Sheath from Skystorm Leatherworks for my F1. 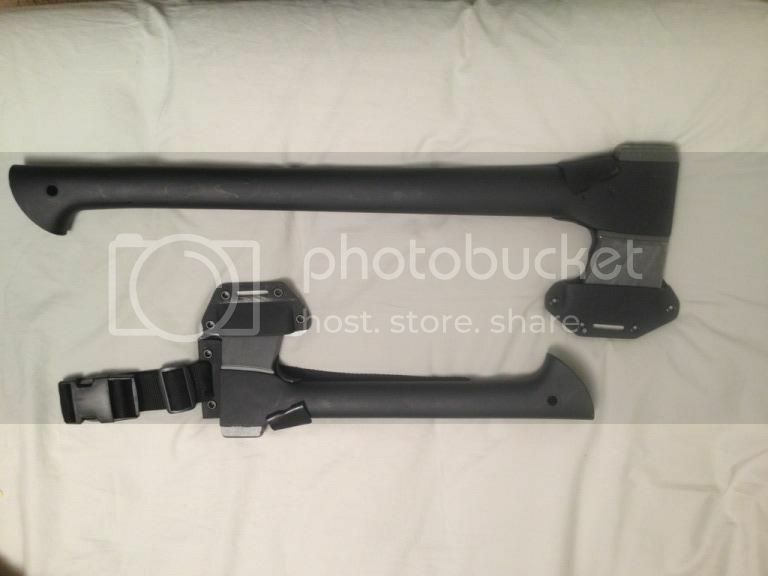 insector, Tight Boot Travler, DL69 and 2 others like this. I found a Bundeswehr Taschenmesser (German army issue pocket knife) for $12 at the surplus store! Same model as this one only mine doesn't have the nail file on the side of the saw blade. I'm thinking of modifying the bottle opener to work as a can opener instead. 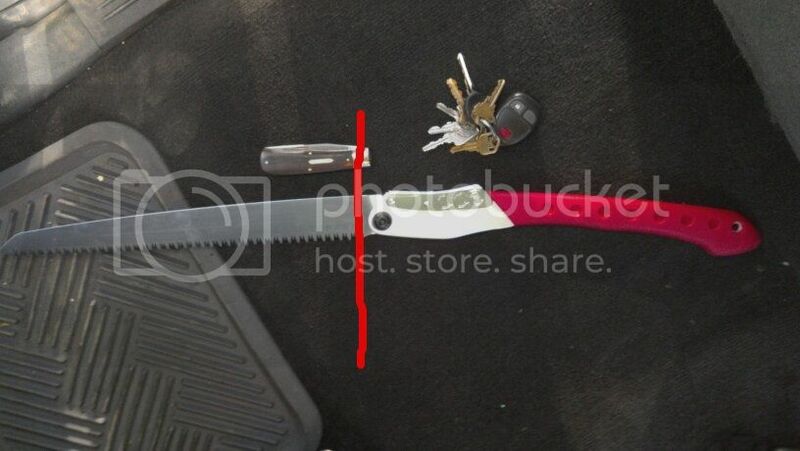 I can't believe they're still including that useless corkscrew on these knives! The blade had a couple of nicks in it but I fixed it up and got it razor sharp. Nice new edc for me. insector, Sosteve, Tummetott and 2 others like this. I don't have pictures, but I recently got a MSR 1.1 stowaway pot, 40oz klean kanteen, condor folding saw, and I ordered a Condor Bushlore this morning. Not doing too bad! I'm actually wearing the viking whetstone as a necklace lot, and I never wear jewelry except for wedding ring. my Becker trio (14, 16 and 2) and a GB small forest axe. 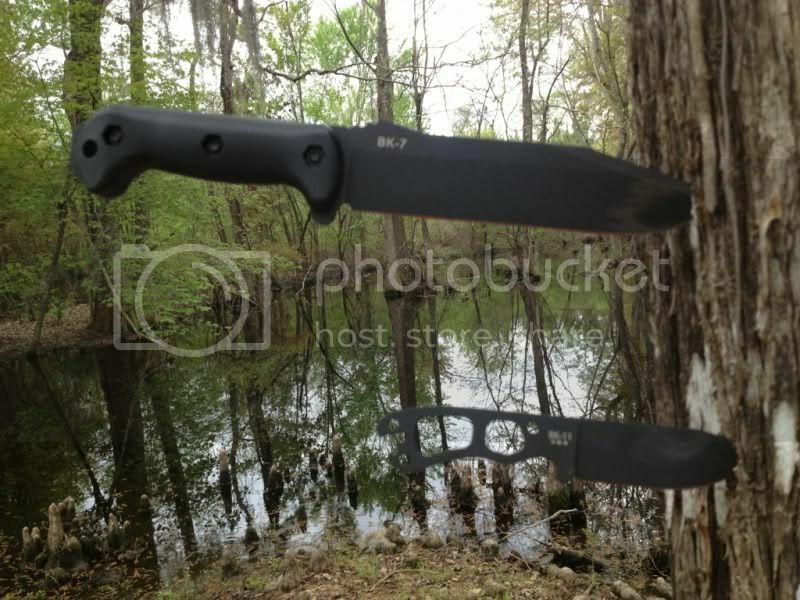 i also got a BCUSA 10x10 coyote tarp and a fallkniven dc4. hopefully ill get some tarp pics this weekend. insector, Sosteve, tickflicker and 6 others like this. I am on a personal mission to work more on learning skills and experience, rather than lusting gear! Huckelberryhound22 and Sosteve like this. Thats rare. Good for you man. Code of The West Survival, Sosteve, PACoureurDuBois and 1 other person like this.